There seems to be some debate as to what exactly makes a garment a pelisse vs. a redingote. I've been calling this project a redingote all along, but the truth is that it probably would be more correctly called a pelisse. Either way, it's basically a coat from about 1810-15, made to keep me warm at the 197th River Raisin Battlefield Commemoration, an 1812 military muster in Monroe, Michigan. 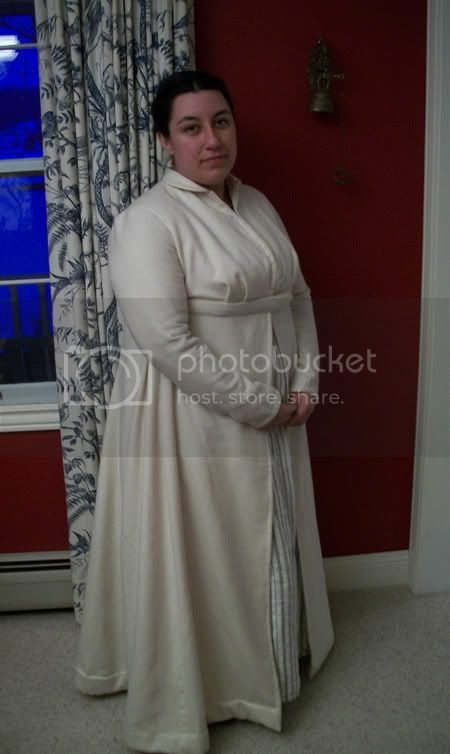 While at the reenactment, I received several questions on which pattern I used. My extremely un-helpful answer is that I don't use patterns--or at least, hardly ever. I make my own. This one in particular was created from my old 18th century body block, with modifications to seam placement and the shape of the armscye. The skirt was mostly measuring and eyeballing. 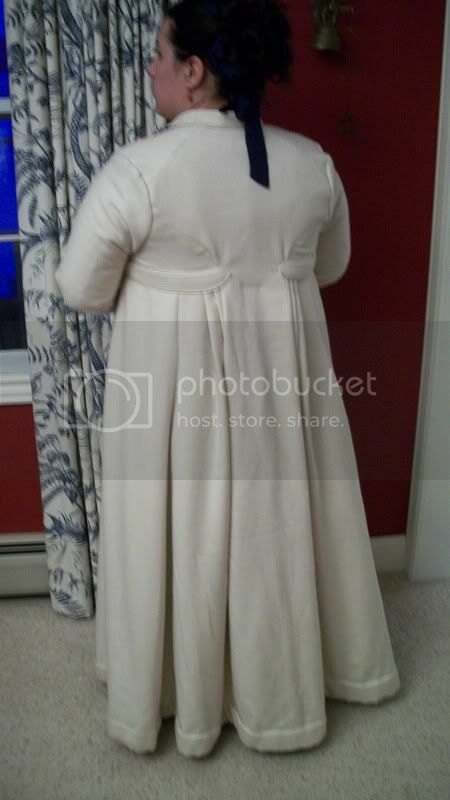 I used a pelisse from Patterns of Fashion I as inspiration, in particular for the treatment of the back and waist. For my main fabric, I used a luscious Italian wool that I've had in my stash since 2006. It was originally purchased for my senior project before graduating from college, but was never used. It's a beautiful piece, though I had limited yardage with which to work. It's trimmed in a matching silk duchesse satin, for piping at the collar, cuffs, belt, and center front. The bodice is also lined with the satin, which is quite luxurious. Also, warm--it was about thirty-five degrees out at the commemoration, and other than my feet and ears being cold, I was quite comfortable!